Crystal Hall, associate professor in the digital humanities, has fond memories of participating in the Brunswick Memorial Day Parade. She rode alongside her father and Rene Bernier, laboratory instructor/support manager and Science Center manager, as they gave rides in their World War II Jeeps to veterans. These experiences piqued her interest in cars, and as soon as she was old enough to hold a screwdriver, she began helping her dad in his garage. Hall began seriously working on cars when she was 13. “We restored my Jeep before I got my learner’s permit so that we could go off-roading with it,” she said. Hall is currently in the process of creating a hot rod from a 1934 Dodge, a car of particular sentimental value as it is the same type of car her grandfather drove. She has restored one and half cars with her dad, but the ’34 Dodge will be the first hot rod she has built. Creating a hot rod is the process of drastically improving old cars—different from restoring cars, which is taking an old car and bringing it back to working order. Building a hot rod can be time-consuming and frustrating. For Hall and her father, it is more like a jigsaw puzzle. As a professor whose main focus is working with computers, working with cars allows Hall to clear her mind and get her hands dirty. Unlike coding, where the products are on a screen, the results of restoring cars are tangible and immediate. “It’s satisfying to code, but it’s a completely different satisfaction to clean something, paint something and put something together,” said Hall. Through her work restoring and building cars, Hall has noticed improvements in other areas of her life. She credits these improvements to the intelligence her dad has shared with her. Another benefit of creating a hot rod is having the ability to build it exactly to one’s needs. With the ’34 Dodge, Hall is planning to install a Corvette engine and transmission as a nod to her dad’s favorite type of cars. She is planning on picking a Porsche color for the car as a nod to her long-lasting infatuation with Porsches. Hall and her father plan to begin the assembly process of the Dodge in September and hope to have it up and running by next summer. They went on a road trip to retrieve the car parts and plan to go on another one when the hot rod is finished. “I have a feeling hot rods are in my future for a long time,” said Hall. Italian Teaching Fellow Angela Lavecchia worked at Bowdoin during the 2014-15 academic year. She then spent a year teaching English and Italian to immigrants in Italy and returned to Bowdoin once again to continue her work as an Italian teaching fellow. Italian Teaching Fellow Angela Lavecchia’s passion for learning foreign languages—she knows four in total—has turned into a passion for teaching them. She has used her linguistic skills to learn more about other cultures as well as to develop her own ideologies regarding immigration in the various countries where she has lived. Originally from a small town in Southern Italy, Lavecchia worked as a teaching fellow at Bowdoin during the 2014-15 academic year. 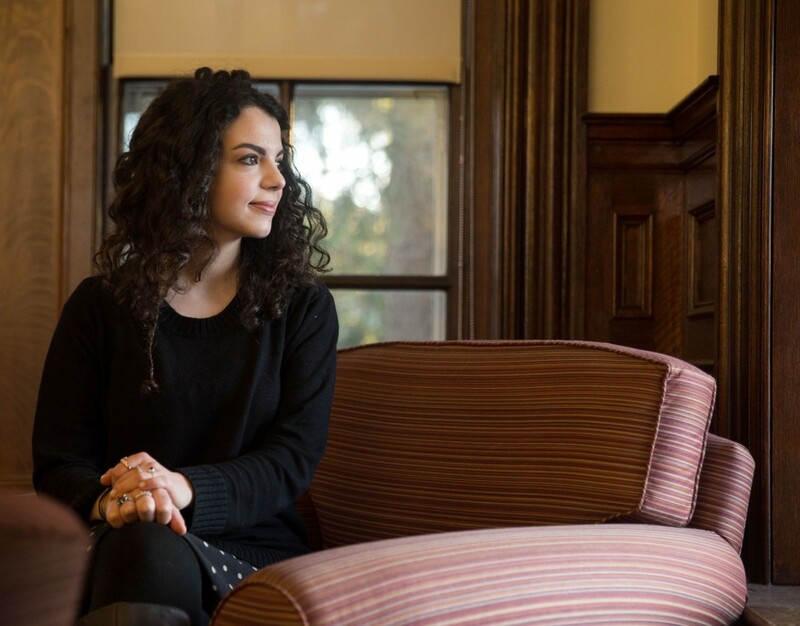 Upon returning to Italy, she taught Italian and English to immigrants for a year before she had the opportunity to return to Bowdoin once again as a teaching fellow. After this year, she hopes to attend graduate school in America and then continue her teaching career. Lavecchia believes that teachers can learn a great deal about themselves through teaching. Lavecchia believes that international teaching fellows are a valuable resource for Bowdoin students. She said that the people she has met over the course of her studies have changed her life by presenting her with opportunities for study that she would not have considered before. As a teacher she hopes to do for her students what her teachers have done for her. “Studying is important not only to get a good job, or a well-paid job but just for yourself, for you own enrichment,” she said, regarding one of the many lessons she hopes to pass on to her students. Lavecchia attended a linguistic high school where she took courses in French, German, English and Italian. She found a passion and pursued Arabic and comparative literature at an Italian university. “I [chose] Arabic because I wanted to study something that was really different from my own culture,” said Lavecchia. “It was a time when, because of the terrorism, we always heard things about Islam and Muslims and extremism, so I was puzzled,” she said. She explained that she wanted to learn more about Islamic culture in order to gain a new perspective. “I was like … there must be something we’re not talking about. There must be something we don’t get to know about,” she said. “I have discovered a whole world, and that helped me to have more respect, and that also helped me to try to get as [much] information as I can, [to] not [be] satisfied with what [I heard] at first,” she said. Lavecchia has enjoyed having the opportunity to continue her language studies at Bowdoin. She studied Arabic two years ago and she is currently taking a German course. If she does not get into an American graduate program, she will return to Italy to continue her work with immigrants. When the language school for immigrants first responded to her application to work there, she was nervous about what her job might be like. “It was challenging at first because I felt like I had a lot of things to do to be good at my job, but then these people, they really wanted to be there. They really wanted to do something to improve their lives, so their attention, their commitment to studying, was amazing, and I’ve learned a lot,” she said. Studying foreign languages has encouraged Lavecchia to be open-minded. “There’s always more … If you know more, you can get new perspectives. You can really get your own idea without being too influenced by what everybody says.